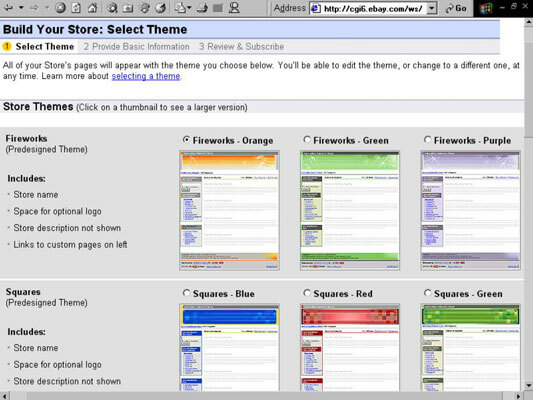 eBay provides some elegant color and graphics themes. Until you have the time to design a custom masterpiece, you can choose one of the clearly organized layouts, either pre-designed ones or based on easily customizable themes. You can always change things later. Don’t select something overly bright and vibrant; you want something that’s easy on the eyes, which is more conducive to a comfortable selling environment. You have the option of selecting a store theme that doesn’t require you to insert a custom logo or banner. It’s recommended that you don’t skip the logo or banner. You need to establish a unifying brand for your online business. You might want to work one up well before you get to the point of selecting a store theme. Type your new eBay Store’s name. You’ve decided on a store name, right? Your eBay Store’s name can’t exceed 35 characters. Before you type it, double-check that you aren’t infringing on anyone’s copyrights or trademarks. You also can’t use any permutation of eBay trademarks in your store’s name. Type a short description of your store. You have only 300 characters to give a keyword filled description of your store and merchandise. You can’t use HTML coding to doll up the description, and you can’t use links. Just the facts please, and a little bit of dazzle. The importance of this description is huge. When people use search engines such as Google and Bing, this is the area where they look to find keywords to classify and list your store. Consider writing your copy ahead of time in Word. Then, still in Word, highlight the text and choose Tools→Word Count. Word gives you the word count of the highlighted text. Check the character count with spaces, to be sure your text fits. Select a graphic to jazz up the look of your store. Now you’re getting somewhere. At this point, your eBay Store is just about ready to roll. Now you should have an idea of what your store will look like. You’re about to open an eBay Store, complete with storefront (drumroll, please). Sign up for the Basic Store ($15.95 a month), and click the Start my Subscription Now button. Click the supplied link to get in the trenches and customize your Store further. If you’re wondering in which category your Store will be listed on the eBay Stores home page, it’s up to you to make that choice. eBay checks the items as you list them in the standard eBay category format. For example, if you have six books listed in the Books: Fiction and Nonfiction category and five items in the Cameras & Photo category, you’ll be in the listings for both categories. Your custom Store categories (read on) are used to classify items only in your Store.